With spring upon us, there comes a handful of new trends to try! At the front line of sassy spring trends we love are pastels. Pretty pastel colors were huge on the runways from Marc Jacobs to Ralph Lauren, and with all the designer hype revolving around sweet pale hues, it makes sense to want to flaunt the trend for spring. Read on for a rainbow of trendy pastel outfit ideas for spring! Light green is a beautiful color to work into your wardrobe for spring. Not only is a pretty pale mint fresh and clean, it is also feminine and flirty. To get the pastel look in mint for spring, try wearing a pair of ultra-light mint jeans with a flowy mint t-shirt. Dress up the ensemble with a jade droplet necklace, an over-sized ring and pretty pastel enamel bracelets. Finish the look with green high heels and a super pretty light green purse. Now you’re ready to take it to the streets! 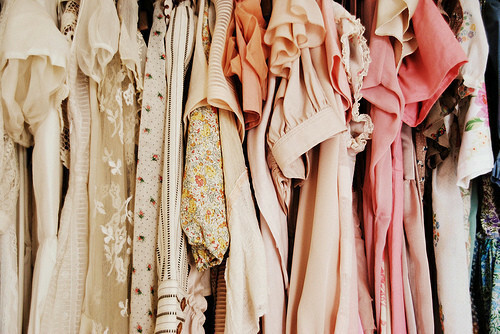 Pink is a color that is synonymous with an undeniably girly vibe. Think pink this spring, and lash out in a flirty ensemble that will have all eyes on you! Go for a layered skirt with flowery applique paired with a light pink t-shirt. Accessorize the outfit with a pink jeweled ring, chunky pink watch and hot pink over-sized bag. Splash some pink on your tips, and go glam in the shoe department with luxe light pink heels. Oh, la la! Wearing aqua this spring means you will be doubling up on two of our favorite spring trends (the pretty pastel trend and the aquatic mermaid trend). To steal this doubly chic spring style, go for a structured light blue skirt with a basic, matching flowy top. Give the outfit a bit of glitter with a golden embellished bangle and a sparkly blue ring. Get the ultimate luxe look with sky-high aqua marine pumps. Canary yellow is one of the most joyous colors a girl can wear. The color is bright, friendly and super sunny! Get the mellow yellow look for spring by wearing a sweet yellow sundress with espadrilles. Accessorize with a yellow clutch, yellow nails, a bauble ring and a charming beaded bracelet. Light orange is a great intro into the summery season, not to mention it was a major runway trend for spring 2012. Get the popping orange punch this spring by wearing a classic sleeveless orange dress with a peach cinch belt and peach colored ballet flats. Add some sparkle and shine to the ensemble with a floral ring, orange bangles and shimmery golden earrings. To add an extra punch of color, go for a bold sunset orange tote bag!